Santa Maria, Mexico was a happy village until the evil Captain Diaz arrived and took all the money and tacos. Now Paso, Pepe and Pico, the Taco Brothers, must bring it all back in the 5-reel 3-row 243-betways video slot machine produced by Elk Studios. 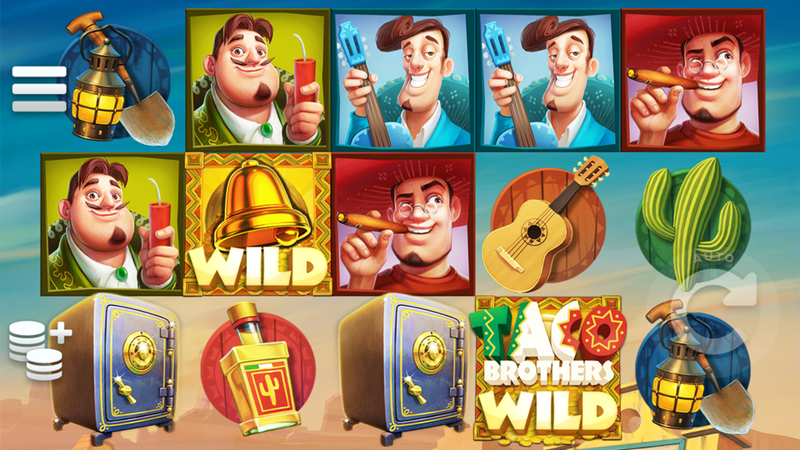 The Taco Brothers slot review brings all details about Wilds, Running Wilds, Free Spins and the rewarding Escape Free Spins feature that you can use to land a big win of 150.000 coins. Tired of reading? Try it yourself in free play mode down below! And when you think it fits – claim one of the bonus offers of our recommended casinos to play Taco Brothers for real! To get paid, form a winning combination with 3-5 themed icons where the brothers have the highest rating of all and bring 50-400 coins. Whenever 2 or more Wilds land on the paytable the Re-spin round will start giving you a second chance to collect 3 bonus symbols. Different strategies are available and you can deploy the most suitable according to your preferences. The same goes for betting combinations that start from €0.10 and may go up to €50 on 1-12 levels with a minimum of 100 coins per bet. Note that the free play mode comes with sufficient amount of credits, but the true fun starts when you play for real. Get 3+ Safe bonus icons to trigger the free spins round coming with 3 different bonus features randomly activated by one of brothers. Running Wilds will move one reel per spin in both directions, making room for other icons, while Captain Diaz puts a brother into prison. The round ends when all Tacos are imprisoned. Finally, Senorita starts a new set of free spins and may release all locked brothers. Tips: during this round, the Exploded Safe Multiplier will be applied to all your winnings. As a new release, the game was completely built in HTML5, which allows cross-platform entertainment without a need to download a special app. 3. What is the RTP factor of Taco Brothers? Officially, the RTP stands firmly at 96.30% around the Elk Studios powered sites. With a sizeable jackpot prize of up to 150.000 coins, retriggerable free spins and interactive bonus rounds, the game has all it takes to be a huge hit. Still, you have to be patient and lucky enough to get the ultimate reward.